Oh come on. Let’s not be shy. 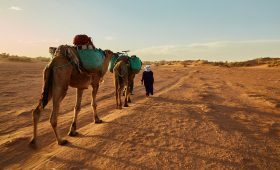 We think Roaming Camels Morocco is the best tour company in Morocco to work with. But then again, we might be a little bias. Don’t take our word for it though. Plenty of our guests have shared their experience on Roaming Camels TripAdvisor page. And we humbly accept your accolades. Truth be told, hearing your amazing feedback and knowing that we gave you the best trip to Morocco, is all the reward we need for this work. We love Morocco! We are so happy to share and make sure you have a great experience. If you are planning a trip, a 14 day itinerary is a perfect way to go. It gives you a chance to see all the great bits of Morocco, ride a camel in the desert, visit Fes, Marrakech, the giant mosque in Casablanca. You will explore ancient medinas and old universities, see the Chouara Tannery in Fes and watch the craftsmen as they tap out the tiny zellige tile that will be hand placed in new installations all over the world. Should you be able to spend two weeks in Morocco you will not be bored. Honestly. Its a great trip and allows you to travel this vast land while taking some time out every few days for a rest with a two night stay in places that beg for a little more time. When you visit the north of Morocco you will marvel at the palaces of the King and many Sultans before him. See the beautiful Royal Stables in Meknes, the tomb of Hassan II in Rabat with the red caped guards surrounding the Royal resting place. Once you think you can’t see anything more beautiful we will whisk you off for a night in Chefchaouen. The famous Blue Pearl resting gently in the arms of the Rif Mountains is a perfect place to have a calm night listening to the local calls to prayer and the occasional belligerent donkey braying out his song. Head to the south of Morocco next, passing through the area south of Fes, a land rich with nomad pastures and camps. See the fossils around Midelt and marvel at the gorgeous Ziz Valley as the landscape changes hour by hour and you realize you aren’t in Kansas anymore. After a long day of glorious vistas you are rewarded with a handsome camel who will take you on your dream camel ride in Morocco! Off you set into the dunes for a lopping journey to your rest stop for the night, a tent snuggled into the dunes of the Sahara. Enjoy a fresh tagine dinner with local food and delicious fruit. 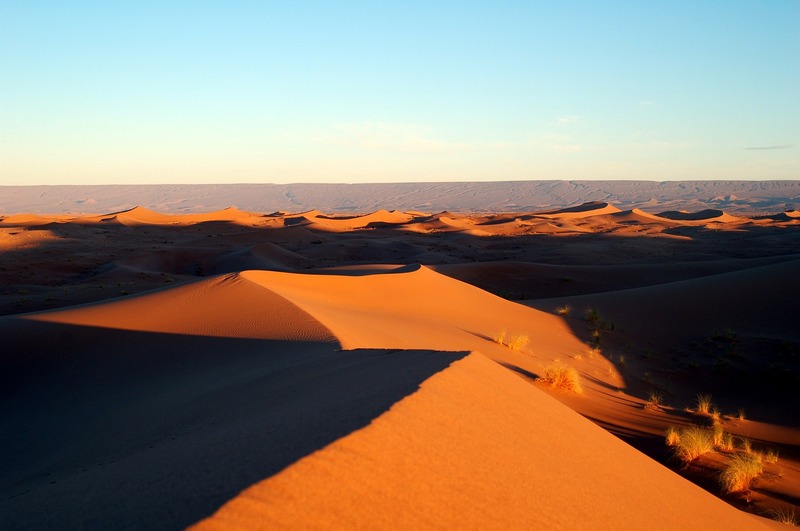 The next part of your 14 day trip to Morocco has you driving across the valleys and oasis of the south. Is there a difference between a valley and an oasis? Oh heck yes. Be sure to talk to your host about that and learn about the south and its amazing landscape. Visit a Berber family for a meal, see how women make bread over a fire, explore the dates that offered to the locals. Enjoy mint tea and get sand in your shoes. See a Berber pharamacy and learn the ancient ways to wellness and beauty. Watch camels roam along the side of the road and spot the goats in amongst the herds of sheep. Spend two nights in mountains outside Marrakech, in Ouirgane, hiking and exploring the valley that sits at the feet of North Africa’s highest peak, Mt Toubkal. Enjoy the laid back warmth and quiet hospitality of your Berber hosts. Recoup some energy before heading off the to sea coast and the old Portugese fishing village of Essaouira. 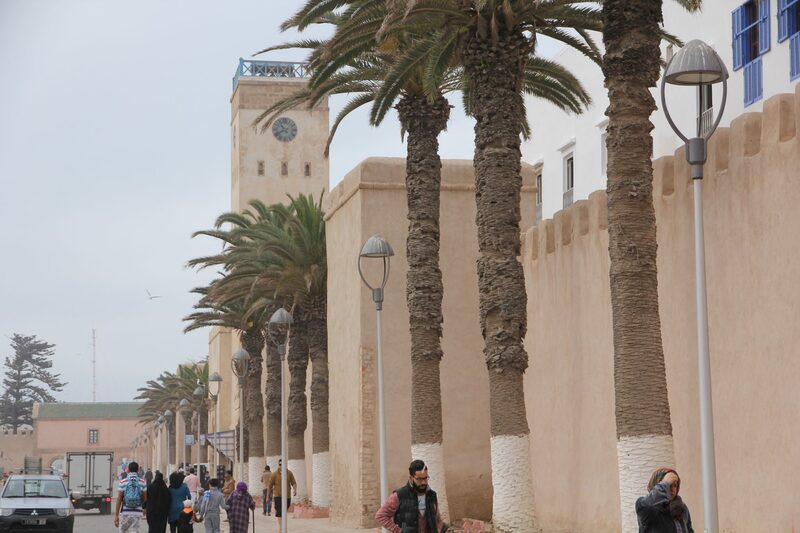 Pronounced S’weera by locals, Essaouira will have you smiling a little smile at the gorgeous seaview and sunsets while tapping your toe to the local street musicians as you wander the super chill medina discovering fabulous local artists. Don’t forget to snuggle down for a meal or three of fresh caught seafood! Next PostAre You Thinking About a Morocco Honeymoon?